Earlier this year, I heard about the Moda Bella Challenge - a challenge to create a quilt using 12 of the Moda Bella Solids. I was a very new quilter at the time, but my interest was piqued. I ordered a fat quarter bundle of the fabrics, thought about my design, and then let the fabric sit for months. I realized about a month or so ago that the deadline was approaching. I know that my skills are nowhere near others who would be competing, but I had an idea and couldn't get it out of my head. I struggle with depression at times. At my lowest points, everything in my head seems very chaotic. When I am at my best, peace seems to reign. I wanted to communicate the idea that while things are often chaotic and there are struggles, that peace will come. Thus, my Chaos to Peace quilt was born. The letters and various pieces on the quilt top are appliqued. I used foundation paper-piecing for the circle of colors, and this was then appliqued onto the top. The stripes at the top of the quilt are regular piecing. 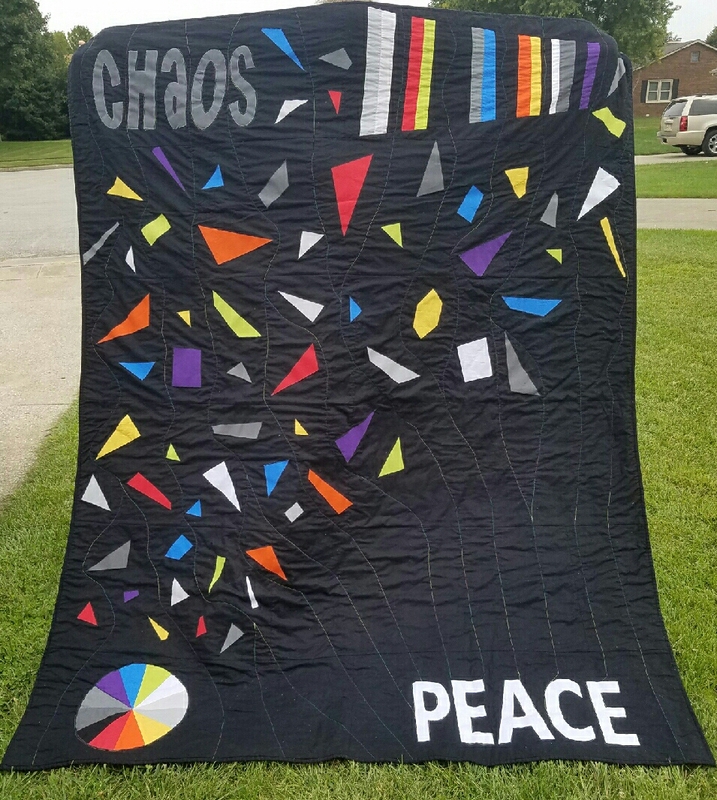 The quilting is very simple - a variegated thread in primary colors with all of the threads at the top of the quilt leading to the word "Peace" at the bottom. As this was my 5th quilt finish, I am very pleased. I was able to get the idea out of my head and onto the fabric. While I did finally share a picture on instagram, I was a little hesitant to share the quilt as this whole design and process exposes a part of my heart. 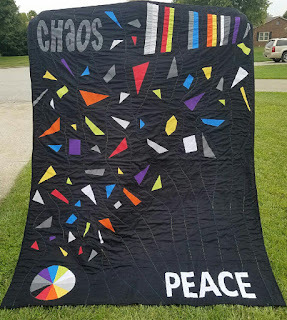 I am also sharing my quilt on Amy's Creative Side Bloggers Quilt Festival. Please be sure to visit the Bloggers Quilt Festival and check out all of the awesome quilts. I hope that you enjoy the quilt and that it has some meaning to you. This is a very personal quilt and I think you have managed to express your thoughts so well in your design. It looks amazing! Quilting can be so therapeutic. What a beautiful way to express yourself. Yes - quilting is very therapeutic. Thank you! Wow, only your 5th quilt! Very impressive. Looks great and the message is clear. Congratulations! I think its awesome that you were able to bring your ideas to life. 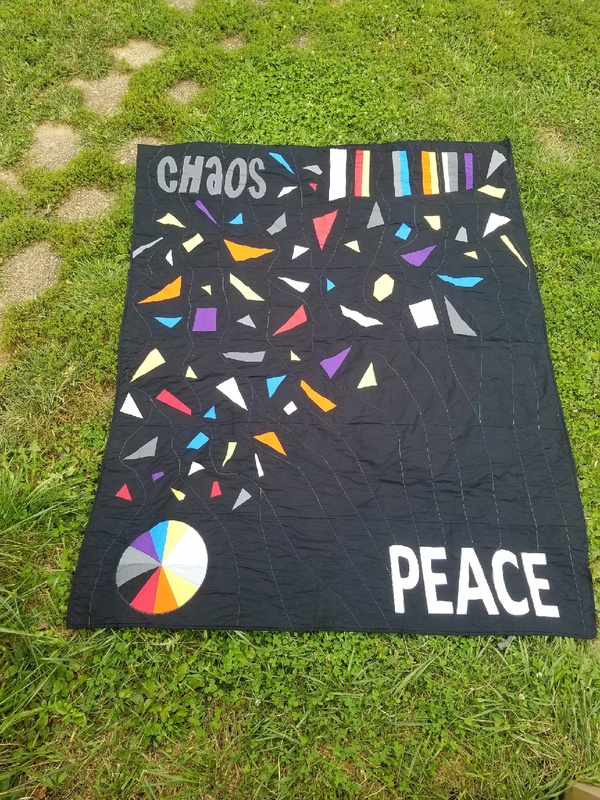 I'm sure bringing this quilt to life has helped you with your struggles! Quilting (or creating any art, for that matter) has that kind of positive effect. It's an awesome quilt, with a clear idea resonating throughout! Congratulations! 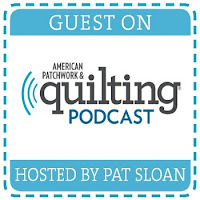 Thanks for sharing your quilt, along with its story, with the Blogger's Quilt Festival. Depression has recently become very real to my family. No longer will I nonchalantly think, "Get over yourself!" It's just not that simple. I am so sorry that your family is dealing with this. It's a struggle. Prayers for you and your family.